Gov. Jerry Brown believes that if you can't beat 'em, join 'em. That's the thinking behind his sudden announcement Wednesday to stop jousting with the California Federation of Teachers, and instead join forces with them to push a new tax hike initiative. "This united effort makes victory more likely and will go a long way toward balancing our budget and protecting our schools, universities, and public safety," Brown said in a statement late Wednesday. In a bid to win broad support, Brown has agreed to drop his proposed half-cent increase in the sales tax to a quarter-cent. 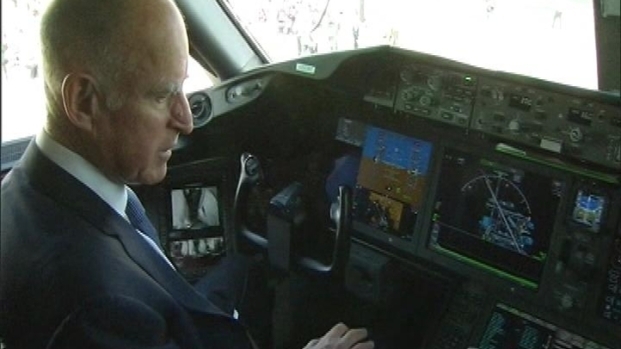 Governor Brown took a tour of the Boeing 787 Dreamliner as it stopped in Long Beach during its world tour. That same day, Brown shifted gears and made an announcement about taxes. He's also agreed to embrace the Millionaire's Tax language pushed by CFT. After all, Brown knows that taxing the rich is a relatively easy sell to voters. Thousands of university students showed up at the Capitol last week to push for the income tax hike as a means of offsetting education cuts. Under the deal announced Wednesday, the income tax rate would climb 2 percent for joint filers making over $600,000 a year, and would climb to 3 percent for joint filers making over a million dollars a year. None of the tax increases are permanent. The income tax increase would expire in 2018, and the sales tax would go away after 2016. The question now is whether the compromise will draw outright opposition from deep-pocketed business groups. Until now, heavyweights like the California Chamber of Commerce and the Business Roundtable have been neutral on Brown's tax proposal. But both had gone on record opposing the CFT measure. Brown's marriage of convenience with CFT leaders was a frank acknowledgement that they were not going to pull their own initiative from the ballot. In fact, CFT put another million dollars into their campaign earlier this week. The agreement leaves Brown's plan with just one rival, an income tax hike measure backed by Los Angeles attorney Molly Munger. It also poses a timetable challenge. The new initiative must now be submitted to the Attorney-General's office for review. Once that's cleared, a whole new campaign begins to gather the 800,000 signatures needed. That process has to be done by late April or early May, since the Secretary of State wants to qualify November initiatives by late June. That's just over three months away. As one Capitol source told me, key Democrats consider that to be "a heavy lift." There are many bumps on this campaign road, but Brown has removed at least one.